My latest label lust is for the new Mulberry Del Rey handbag which is named after the artist herself, Lana Del Rey. The Del Rey is simple and chic with a vintagey design which definitely suites Lana's style. It comes in colours including Black, Brown, Red and Blue. 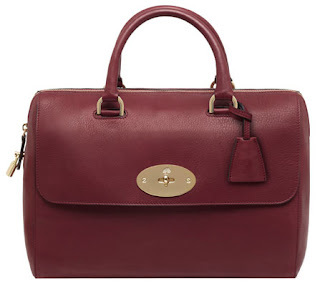 My personal fav is the gorgeous red which would go perfectly with most outfits. The Hunger Games hype may be over but I'm still loving the nails which Effie Trinket wore during the reaping in the film. I decided to try it out on myself today and thought I'd share what I did. Instead of the pink like Effie was wearing I decided to go for an orange as it was a colour that I had which went well with the gold glitter I have already. This is a really easy tutorial and is great because you can personalise it to your own style! 1. Start off by applying a base coat to protect your nails and give an even surface. 3. Paint the edge of your sponge with the colour you have chosen to blend in. 4. Gently sponge the colour onto your nails approximately three quarters of the way down and allow to dry. Repeat step 3 and apply half way down the nail to give a more opaque colour on the top half of your nail. 5. To get rid of any excess nail polish on your skin, use a cotton bud dipped in nail varnish remover and gently remove the nail polish. 6. Apply a top coat to seal in the design. If all the nail polish does not come off of your skin, don't worry! Wait for your nails to dry and take a shower. This always works for me! Just before christmas I managed to get my hands on this very sought after body glitter from The Body Shop. BUT until last weekend I totally forgot about it (silly me!). I used it this past Saturday on a night out with my friends and I must say it will be a staple product for me on nights out in the future. The limited edition item is a shimmery powder with flecks of glitter which can be used all over the body including your hair! I used it on my legs and chest area to give me a little sparkle. I avoided using it on my face because I didn't want to look like a disco ball! But I'm sure with careful application it would make you stand out from the crowd. So whats good about it? It comes in two colours; silver/pink and gold. I opted for the silver/pink as I have pale skin so it would suit my skin tone better. 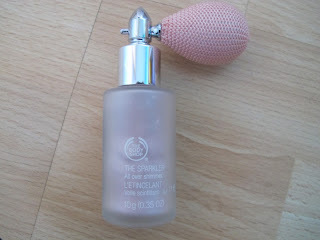 It gives your skin the perfect shimmer and it looks really pretty on your dressing table too! The atomiser was quite expensive, about £15 if I remember rightly and being limited addition make sit hard to get your hands on. My sister has been nagging me to go shopping to London with her for a long time and we finally found time to go yesterday. We booked our tickets weeks in advance to get the best deal and in the end it only cost me £20 to get the train there, including an oyster card (thank you student rail card), and if you live in my part of England you know thats an absolute bargain. Anyway I thought I would show you some things I brought whilst on our little shopping trip. Lets start with clothes because this is the main reason we went! We really wanted to see what the Forever 21 was like in the UK. I've heard reports that it is not as good in the UK as it is in the USA however I was thoroughly impressed with it. Apart from the fact its not as cheap as in the US (but still affordable prices nevertheless) I found there to be a large selection with on trend pieces and friendly staff. I only bought 3 items but intend on saving saving saving and going back for my birthday in August. The first item I brought was a simple white sheer vest top with a tie bow. For only £8.75 this was an absolute bargain and now I wish I had bought it in navy too! 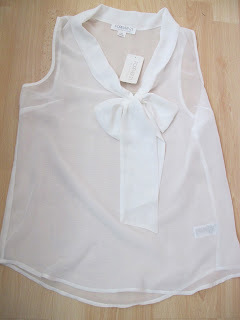 The next top I purchased was a beautiful baby pink blouse with detailing around the neck for £14.75. It is sheer again too however has a texture to the material. 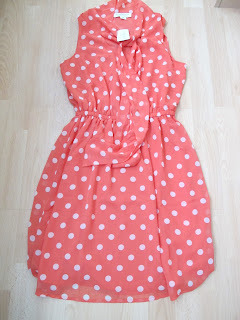 The last thing I bought was a coral polka-dot dress, again with a tie bow around the neck. I thought this would be lovely to wear during summer with a pair of wedges and would be perfect for a variety of occasions. The dress again cost £14.75 which I thought was an amazing price for such a nice item. The next shop we went to was the newly opened Gilly Hicks on Regent Street. it is joined with Hollister next door and is absolutely huge! I have to admit to getting lost a few times. I bought a white slouch top for £18 which would look great with a simple pair of denim shorts and flip-flops on any summers day. I also got a simple t-shirt for £20. I'm a sucker for wearing t-shirts, I just find them so comfy! Now lets move on to the beauty items! Again, I purchased 3 items, 2 of which were essential purchases because I had run out! I needed a new cleanser and felt like a change from my normal. As I said in my New York haul I have been using the Benefit Facial Emulsion and have been so impressed I thought I would try something else from the line so went for the Foamingly Clean Facial Wash. It was £16.50 and hopefully will live up to my expectations. Whilst in the Benefit shop, I also thought I would try out the It's Real mascara that everyone has been raving about as I needed a new mascara anyway. I'm yet to try this out yet but as soon as I do I'll let you know what I think. Lastly, whilst having a little look around Selfridges in the Chanel section, my eye caught this beautiful lipgloss in Jalousie. The picture below does not do it justice at all. It is a beautiful fuchsia pink lipgloss which is highly pigmented. £20 is not what I would normally spending on a lipgloss but I couldn't resist this little gem.